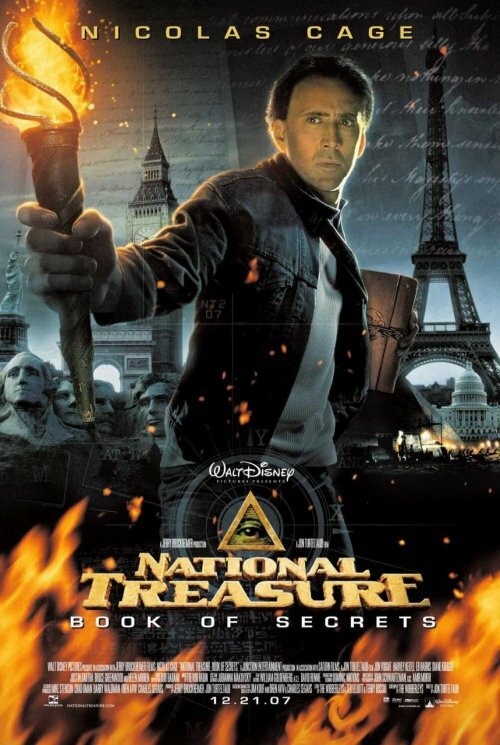 When it comes to a big, by the numbers studio movie like National Treasure 2, I don’t often expect anything original from the poster. But I do expect the poster to be very well made, slick and for it to transmit one clear marketing message. So I have to wonder, what the hell went wrong here? It’s like they just decided to throw any remotely interesting element from the movie into the poster. Assorted national monuments? Sure, put them on the background. Nic Cage? Gotta have him in there. Old maps, books, and hieroglyphic seeming writing? Yep, put it above everything else but make it see through. Fake looking fire? Use lots of it! The result is one big unappealing mess. Really, a surprisingly bad poster. Yes it is very boring. It could have been used for the last movie, nothing special to relate it to this movie except that he is holding a book. And the eye-triangle-thing is in an odd position near Cage’s crotch. Call me crazy, but I sort of like it. It’s messy and cheesy (which I usually HATE), but I like the color scheme. But again, I was one of the few who actually liked the original film and will still defend it to a point. Yes, I guess I am a bit crazy.